Rarely do I band about the word 'perfect'. It is used far too much among my generation to describe trivial, mundane things; hairstyles, items of clothing, et cetera. Rarer yet do I use the word to describe music - for me, to call something perfect is to hold it so highly, nothing compares, nothing comes close. It is likely it will never be done again, a once-in-a-lifetime moment, a dream becoming reality. Superlatives needn't apply to Kid A; it doesn't need them. As far as I'm concerned, this is that perfect piece of music. Why do it regard it so? I have a number of reasons. This is the sound of a revolution; Radiohead, a 'guitar' band that were tired of the gruelling touring and the bloated expectations, a band that was experiencing an agonising hangover from their past successes. They recognised this - continuing in the vein of OK Computer was going to kill them. So they destroyed themselves, and their defining 90s sound, and they became so much more; havoc and harmony, regret, false hope, distilled into 50 minutes of relatively guitar-less music. The 'rock' hooks, the riffs, were abandoned, and instead listeners are greeted with a chilling synth organ, complete with a hidden bass track (revealed to those in possession of a high-fidelity stereo system), and the warped voice of Thom Yorke, akin to a fish writhing around above water, gasping for air, begging. "Everything, In It's Right Place" - somehow, it doesn't seem that way, as side one track one reveals yet more eerie depths as it progresses. 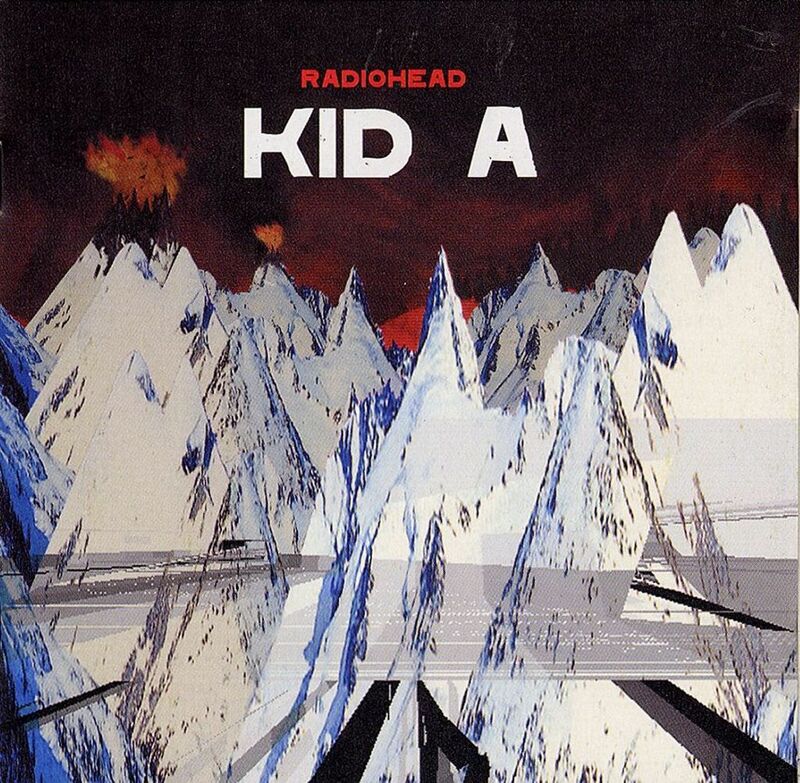 Kid A follows; a lullaby, a warm duvet, a dream, smothered with a vocoder. The National Anthem immediately drags you back into reality, providing a sharp needle for your dreamworld balloon, in the form of a ferocious bassline, and a freestyle jazz band that swarms like a colony of wasps. How To Disappear Completely proceeds to drag you back under; a track that bears resemblance to former Radiohead glories, filled with soothing strings. The ambient Treefingers ends side one, and at first it comes of as a calming relief, only to bear more haunting aspects upon close inspection - you can hear muffled cries for help, as if the song has something sinister lurking beneath the surface. Side two begins with Optimistic; "finally, an anthem!" you may say, although the lyrics seem to be cynical, taunting even: "Try the best you can, the best you can is good enough" Yorke jeers, with what appears to be sarcasm, false optimism. In Limbo follows with a stream of arpeggios, overlapped by pleas, "I'm lost at sea, don't bother me", before crashing to a close, in a wave of alien beams. Idioteque picks up the pieces, with a thudding, jarring beat that echoes Aphex Twin and Bjork, and a strained synth line. "Women and children first" foreshadows a mushroom-cloud apocalypse, where humanity is at odds with itself once again. The screech of the strings segue into Morning Bell; another song that can identify itself with the Radiohead of yore, yet feels like an entirely spookier direction altogether. Finally, the journey culminates in Motion Picture Soundtrack, a song that predates hit single Creep, blossoms into life with an organ and harp, only to shrink back into nothingness, with the ever cryptic, "I will see you, in the next life". The hidden track, believed to be called Genchildren, follows, with a soaring ascension into the musical heavens. Make no mistake, Kid A is not to be appreciated as background noise. This is not an album you can rock out to on your mates speakers; this requires careful attention. Give it this, and it transcends anything you may consider to be music - it becomes an emotional journey, a rollercoaster of highs and lows. An inhuman, yet oddly familiar fantasy world, represented by 50 minutes of digital sound waves pressed onto a compact disc (or whatever platform you may choose). That, dearest readers, is the sound of perfection.